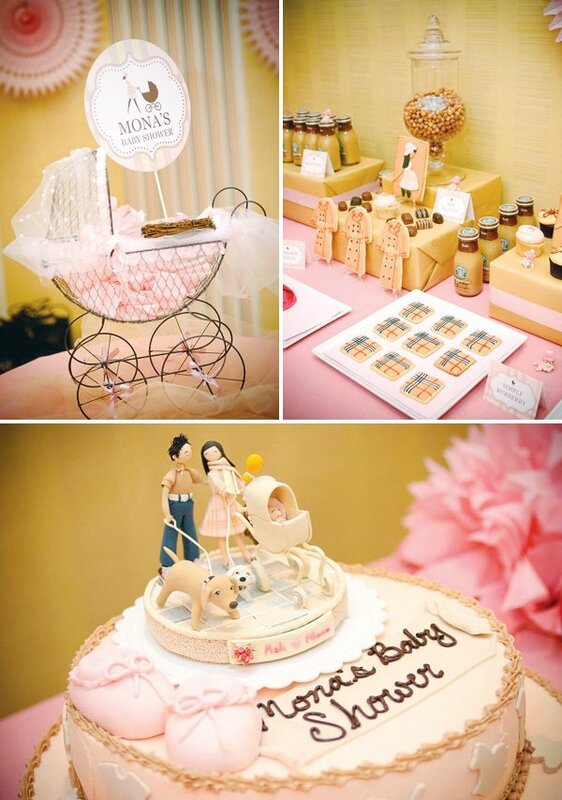 Imtaz from Love Pretty Party did a fabulous job styling this Burberry Baby Shower for an expectant couple that happens to be very fond of the iconic British brand. 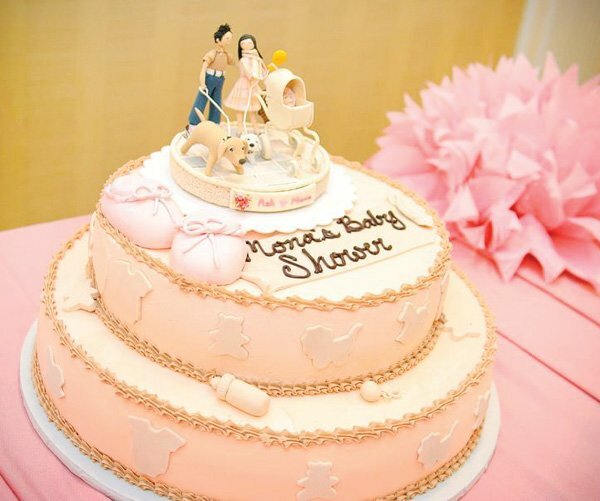 In addition to the fantastic trench coat cookies, one of my favorite details has got to be the amazing diaper cake that’s shaped like a baby carriage! 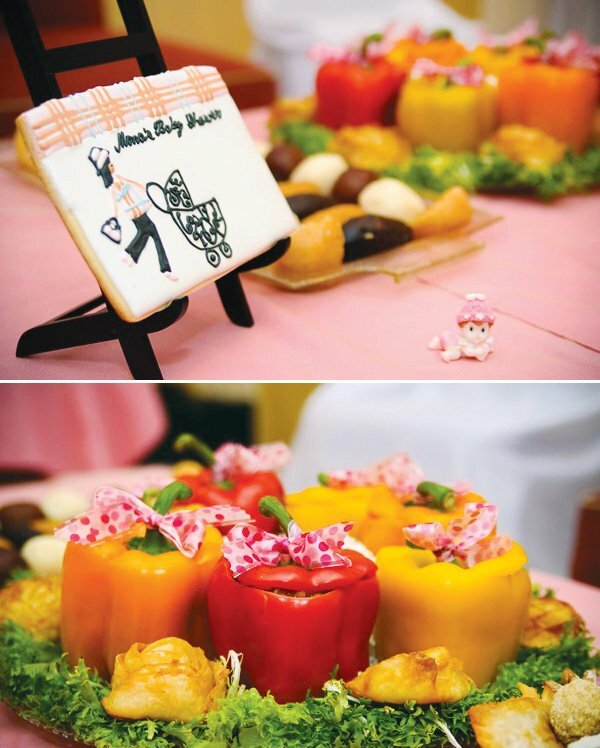 And the table centerpieces were coordinating mini diaper cakes decked out in the same burberry inspired ribbon.. so clever! 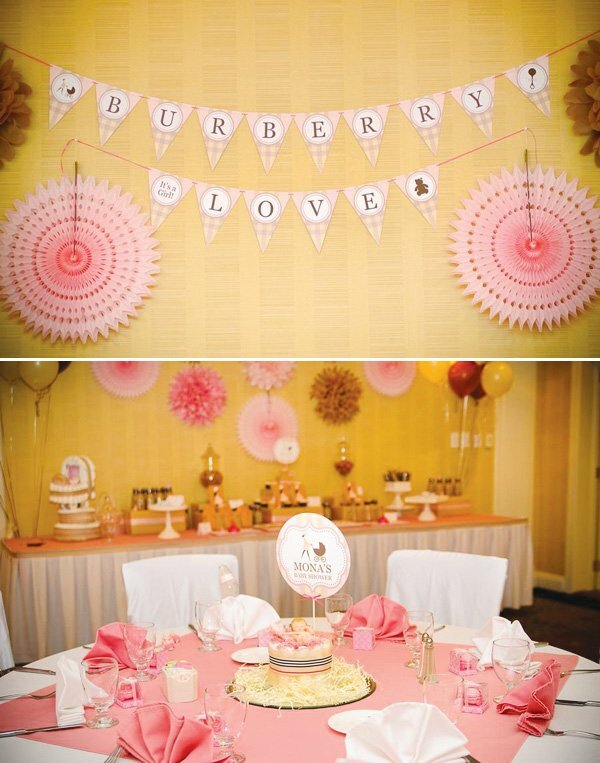 I recently planned a baby shower for a sweet couple and their love for Burberry was used as the inspiration for the event. 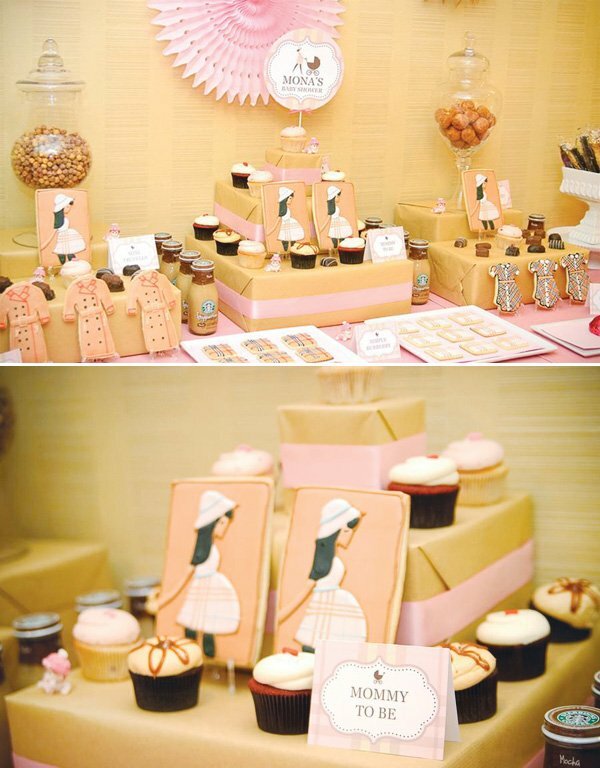 We used her favorite Burberry scarf (mix of pink, tan and beige) as the color palette for the baby shower. 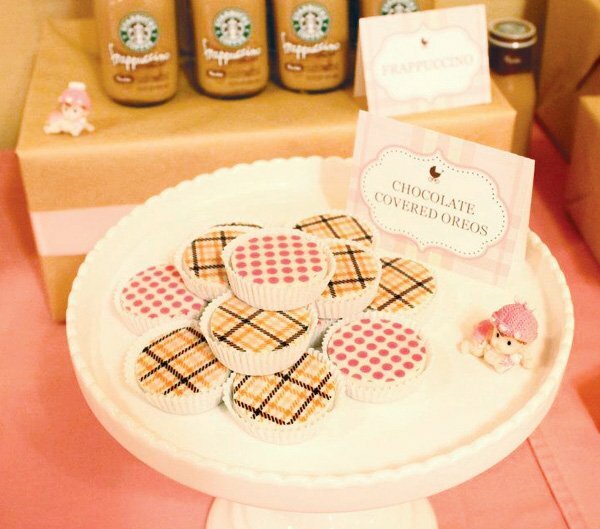 Also we incorporated the original burberry plaid pattern through out the event. The dessert table back drop was kept very simple and decorated with tissue pom poms and some paper tissue flowers. 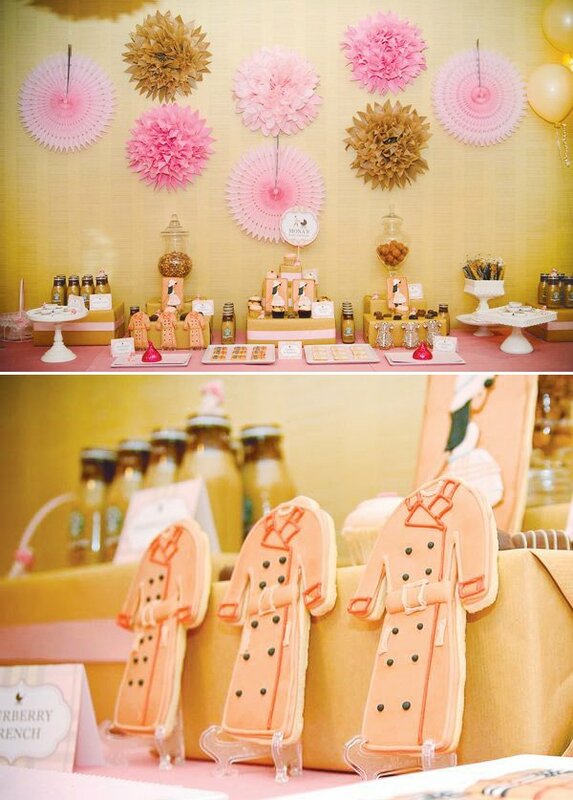 Main attraction of the dessert tabel were the amazing Burberry inspired cookies that were made. Cookies included traditional burberry plaid baby girl dresses (Burberry Baby), burberry trench coat (Burberry Trench), a pregnant mom to be cookies with her burberry dress on (Mom to Be), square burberry tradional and pink plaid cookies (Simply Burberry) and a custom 5 x 7 cookie made to match the baby shower invitations. 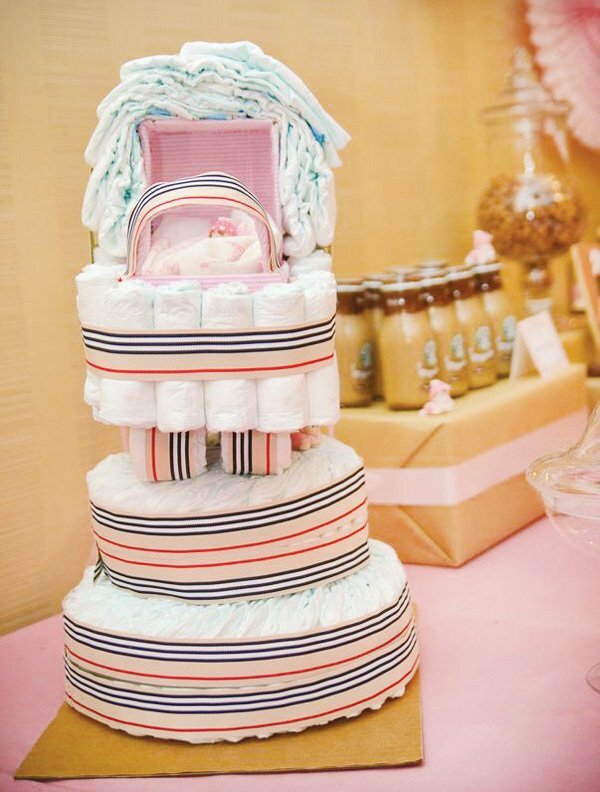 A hand made baby carriage diaper cake using a shoe box, new born diapers and Burberry inspired ribbons was made for the dessert table to match the invitation theme. 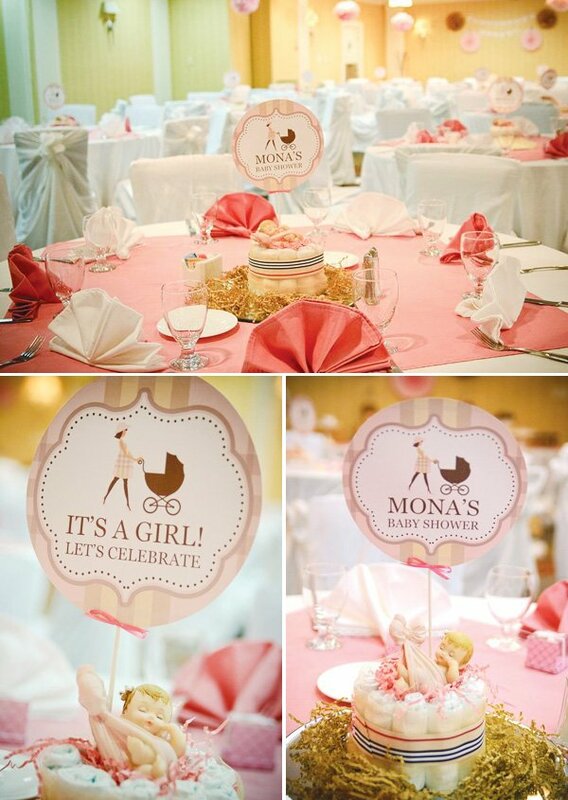 Mini diaper cake center pieces were hand made for the guest tables using new born diapers, burberry color inspired ribbons, paper shread, ceramic doll babies and were toped with customized six inches round cake toppers. 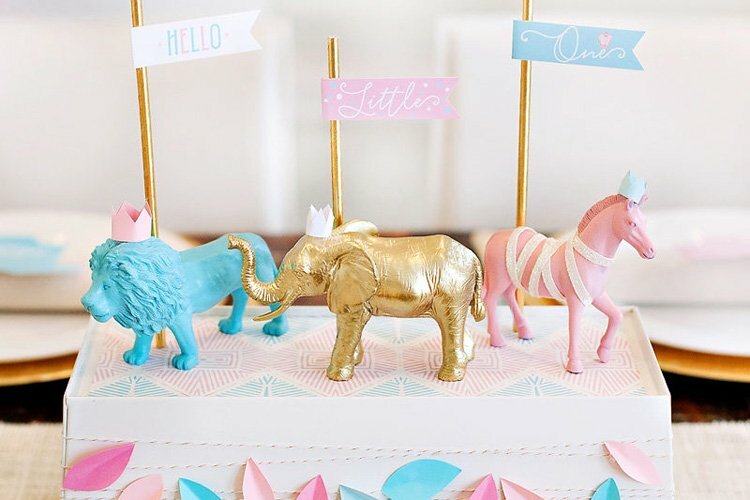 A Custom cake topper was literaly like their family portrait. Every single detail was customized, from his hair style to his favo burberry polo shirt, blue jeans, favo white belt to his red converse that he wears everyday. Mom-to-be with her favorite burberry dress and scarf with her go to ballet flats and her Louis Vuitton purse, walking their two dogs Coco & Nemo. 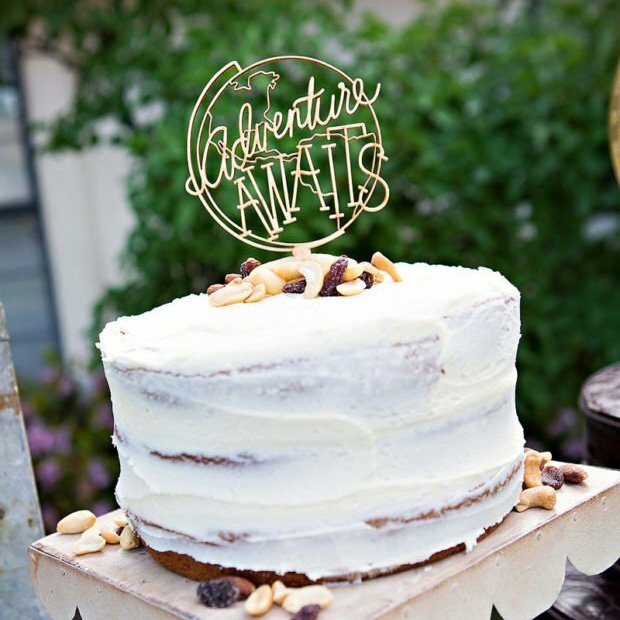 Looking at this cake topper was like looking at their family. We created a wish tree using Manzanita branches, some pink crystals and customized wish tags were used for the wish notes. 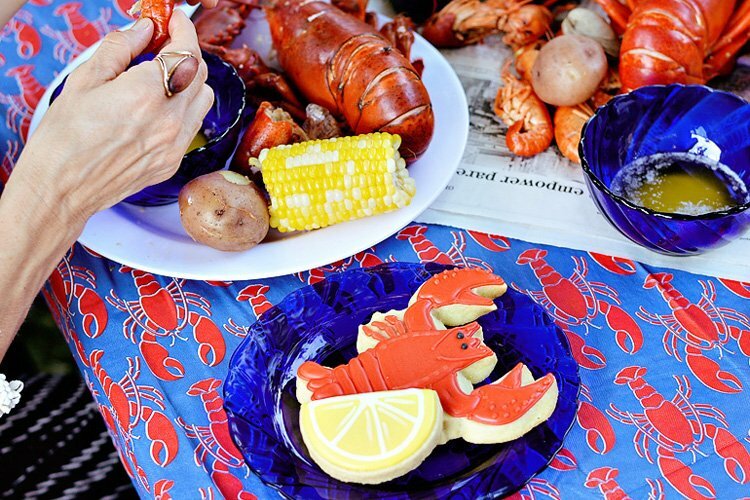 What a gorgeous baby shower! 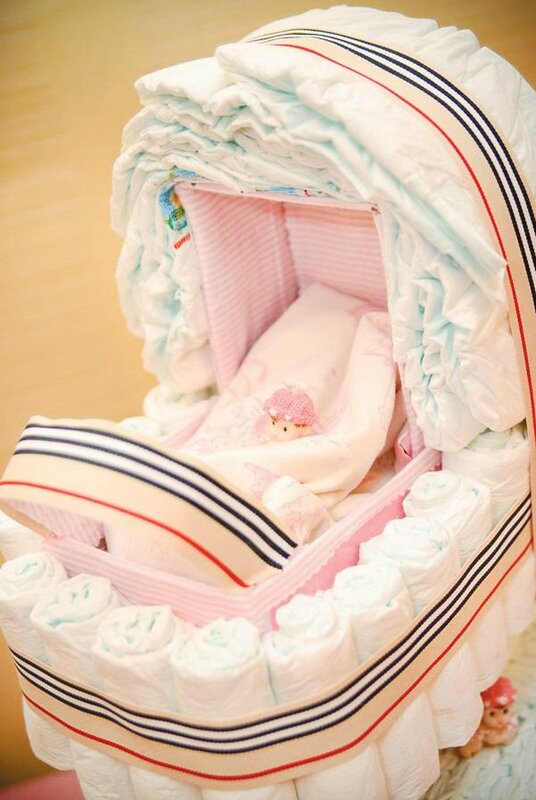 Love the stroller diaper cake! 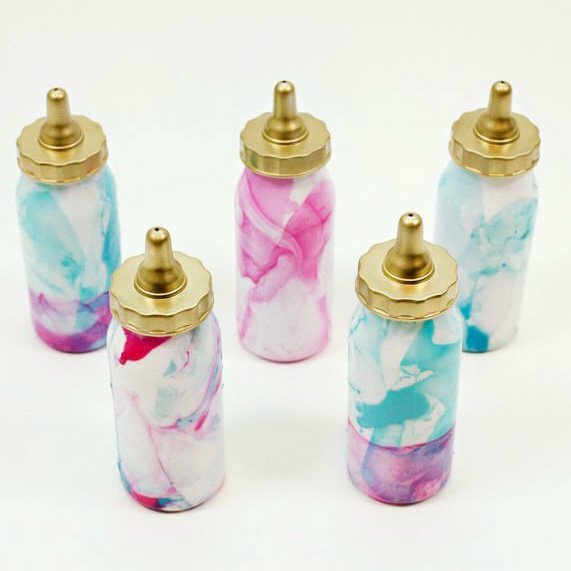 And the sweet little bows on the pepper tops are really cute! Where did you get the wire baby stroller? I love your centerpieces!! 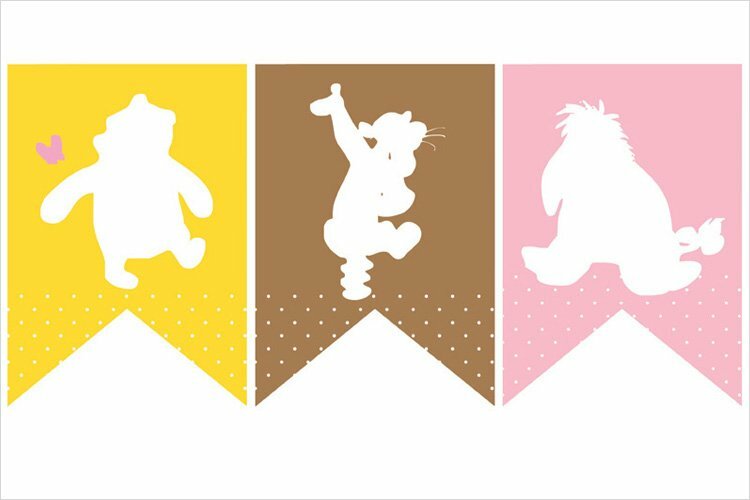 I want to do something similar where did get those cute babies from??? 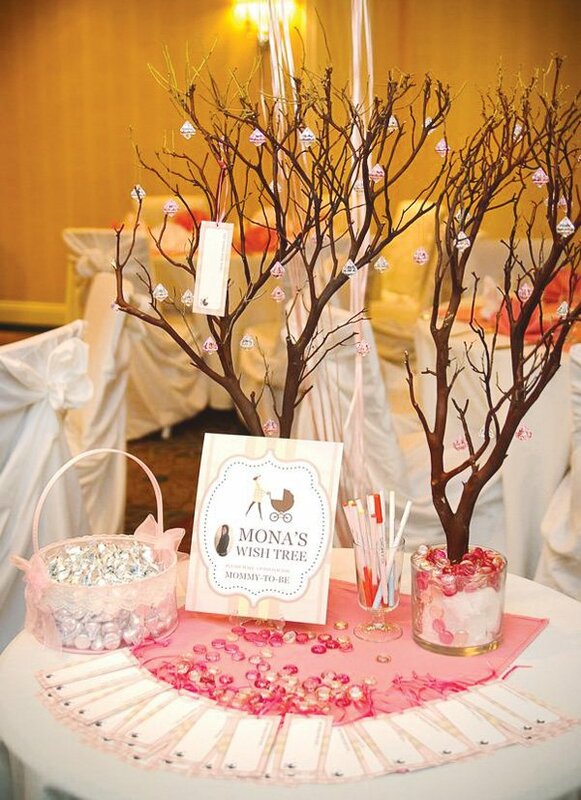 Love the wishing tree idea….where did you find the pink crystals?